Father's Day and FREE Shipping! Father's Day has always been a special holiday for me. I grew up with the best Dad in the world. I bought him mugs and soap-on-the-rope that said just that. And then just over 2 years ago the Best Dad in the World died, leaving me without my Dad and my daughters without their only Grandfather. Luckily, my daughters have the next best Dad in the world, my husband. I feel pretty lucky to have found a partner for life who is so much like my Dad and is a wonderful father to our girls. My Dad loved sweet treats and he is the inspiration for all that I craft and create at Kimberley's Kitchen. 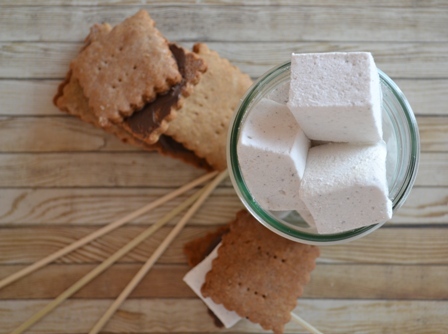 From Rocky Road marshmallows, to gourmet s'mores, to peanut brittle, all of my ideas and creations are inspired by what he loved. One of my best-selling products from the first day of business has been Dad's Peanut Brittle. This is the recipe he used and loved. It is a classic brittle recipe with lots of butter and salty peanuts. I think he would be very pleased to see that it is still a best-seller and one of my most requested products. I have crafted fresh batches just in time for Father's Day. It is perfect for giving or snacking or sharing. However you enjoy it, know that it comes from the heart of my family to you. As an extra special treat, I am launching FREE SHIPPING on all orders over $50!!! This is very exciting for me and I can't wait to send you delicious treats. Visit my online SHOP to see more!